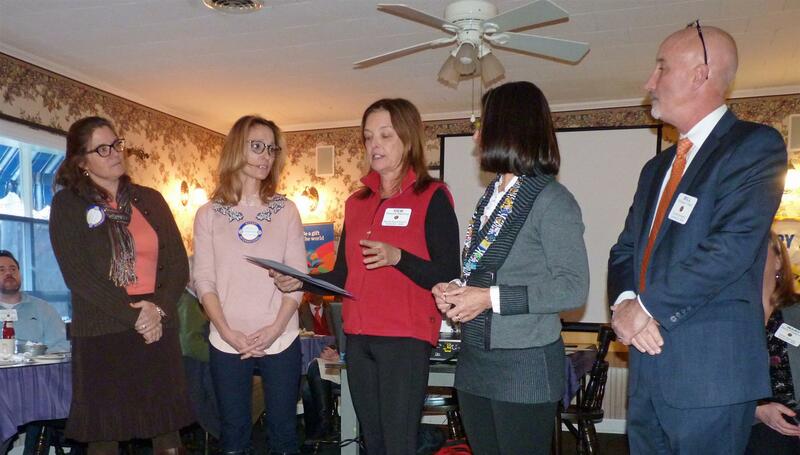 At their meeting on January 7, the Ipswich Rotary Club recognized Winthrop School educator and social worker Deborah Trevarrow with their highest honor, a Paul Harris Fellowship. Deb was recognized for her many years as faculty advisor to the Rotary sponsored youth service club, Winthrop EarlyAct, and for her exceptional contributions to youth in our community. Youth development is a major goal of Rotary International. Ipswich Rotary partners with the Ipswich Public Schools to sponsor youth service clubs at the High School and at both elementary schools. Each year, the club also sponsors a year-long international Rotary Youth Exchange which benefits the community as well as the students. The EarlyAct club is open to students in Grades 4 and 5. The club follows a format similar to Rotary, meeting to identify, discuss, and select projects and to foster a spirit of “Service Above Self”. Their community and international projects help the students learn, appreciate and value service that improves lives. With this background, it is understandable that Deb facilitates the “Student Leadership Program which has grown to include 100 fourth and fifth grade students. The focus of this group is on service and supports the development of skills such as communication, critical thinking and cooperation.” As a natural extension of that initiative, EarlyAct has given her the added opportunity “to partner with Ipswich Rotarians” and be “inspired by the projects that the children initiate to help others”. Ipswich Rotary congratulates Deborah Trevarrow, PHF, for her dedication and “Service Above Self”.